"Embracing the Cross" - What vices or bad habits can we specifically work on getting rid of this Lent to prepare our hearts for Him at Easter? EPIC Ministry will also assist in producing quality promotional materials for the mission. EPIC Ministry does not charge a fee for this service. However, a freewill offering is asked to be taken up at the end of each evening to support the work and mission of the ministry. Is there flexibility regarding the structure or topic? Yes! The presenters have years of experience in developing meaningful, inspiring talks in a variety of ways and on a variety of topics. What does "a limited number of Oahu parishes" mean? 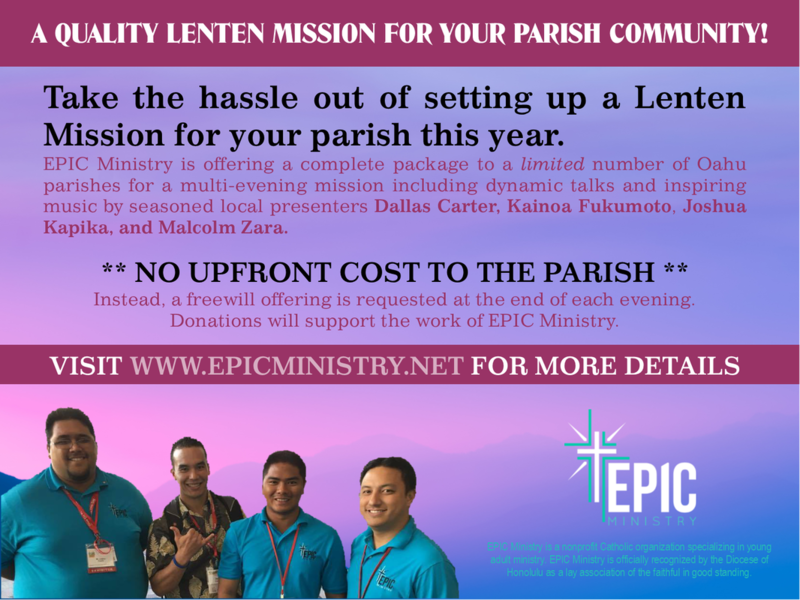 Depending on the number of requests and the length of the requested missions, the presenters can only commit to a small number of parishes on a first-come, first-serve basis. Is this service provided to parishes on outer islands? It is possible (depending on scheduling), however, the parish is responsible for travel and lodging expenses. Is this service provided for a Saturday-only mission? DALLAS CARTER is a well-known dynamic Catholic speaker and catechist who has given talks in venues from small groups to the Los Angeles Religious Education Congress. He has two degrees in theology and current serves on the Board of Directors for EPIC Ministry. KAINOA FUKUMOTO is an established diocesan musician, parochial school principal, and experienced Catholic presenter. He is the founder and President of EPIC Ministry. JOSHUA KAPIKA is a professional musician whose talents never cease to amaze and inspire audiences. He is a seasoned ministry leader and currently serves as Vice President of EPIC Ministry as well as a Chapter Coordinator. MALCOLM ZARA is an engaging Catholic speaker who uses his "gift of gab" to inspire others to follow Christ more intimately and closely. A proven young adult leader, Malcolm serves as the leader of EPIC Ministry as its Executive Director.